Bishop Joe Simon met with Boone Mayor Loretta Clawson during the Clergyman's Community Crusade. 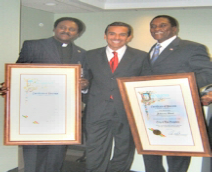 Bishop Joe Simon met with Los Angeles Mayor Antonio R. Villaraigosa accompanied by Tuskegee, Alabama Mayor Johnny Ford. 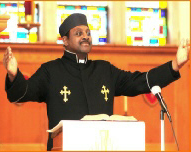 Bishop Joe Simon, preaching and teaching throughout our communities and the world. "Proclaiming the Gospel of our Lord and Savior Jesus Christ to all the world." ....we as Christians, Kingdom of God workers must always have concern for the hurts and social needs of our fellowmen. Christians have a duty to address social issues in using media and every modern means of communication available to us to spread the Gospel of Jesus Christ throughout the world. ...There is one body, and one Spirit, even as ye are called in one hope of your calling; One Lord, one faith one baptism. We need your help, your support, and your donation. I trust you will take a moment today to send your gift to the Minister Joe Simon Outreach Ministries, NFP towards the great needs that continue to burden our communities. Your compassionate contribution and donation will bless many in these crucial days. May God bless you as you faithfully join forces with us, we are asking you to become a part of, join in and be a link to our Joe Simon Community Outreach. Please send your much-needed donation today. Thank you very much. It's awesome, it's cool and it's a blessing to give a donation. Thanks! Want to join me in making a difference? I'm raising money for Minister Joe Simon Outreach Ministries NFP, and any donation will help make an impact. Thanks in advance for your contribution to this cause that means so much to me. Our current project is to raise money for the Simmesport, Louisiana Youth Choir to travel to New Orleans and have a recording session. Funds will be used for travel expenses and recording time. Bishop Joe Simon is a three-time Grammy Award winner and the leader of this project in his hometown.